Last week I was walking down a sidewalk in a little town where I happened to be when I heard the familiar 'potato potato' sound that one associates with the motorcycle that Harley Davidson has been making for about a hundred years. I looked up and saw I was correct, and that this motorcycle wasn't just any Harley, it was a Heritage Springer. When Harley produced the Springer in the late 90's they were cashing in on the retro fad that the Boomers were fueling and I think they got it just right. The Springer looks almost exactly like the original Harleys of the late 40's and early 50's, with its leather seat and saddlebags and the spring suspension at the fork. And almost every time I see one it sends me on an instant nostalgia trip to the time in my life that I owned and rode such a machine. I bought a 1949 Harley FLH in a town on the Ohio river one February afternoon when I was 18, and I rode it the 120 cold miles home in such a state of euphoria that I don't remember being cold. The machine was a beautiful red color, it had loud exhaust pipes and leather saddle bags and it glowed with chrome and red reflectors. I kept it for four years and rode it way too fast and leaned over way too far in the turns and looking back, I'm very grateful it didn't kill me. 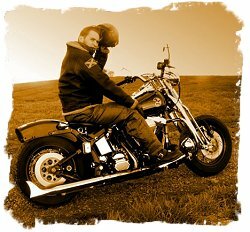 When I think about the rides that I made on that motorcycle I can still really feel the moment if I concentrate. I'm at high speed and the hair on my helmetless head waves hard in the wind, while my hips twist, as I sway, first right, then left, through the curves of a winding West Virginia back road. I lean the Harley until the hinged foot board scrapes the road and I feel my foot lift and hear the exhaust note change as the pipe and my ear get closer to the blurred pavement. At night sparks shoot back from the boards and it seems that rockets are chasing me through the turns, or perhaps powering me through them.